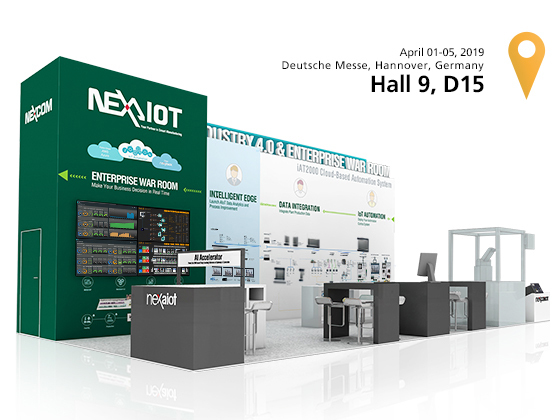 NEXCOM group (NexAIOT, NexCOBOT and NEXCOM) will introduce iAT2000 cloud-based automation system industry 4.0 and enterprise war room at this year’s Hannover Messe on April 1 to April 5 and Booth D15, Hall 9. NexAIOT will shows industry 4.0 solution development which based on open architecture and industrial standard, can generate a powerful ecosystem alliance environment. NexCOBOT will shows 7 axis robot demonstrates a LED lamp smart pick-up live demo with Intel HDDL AI acceleration. Welcome to contact us for making an appointment in advance and more product information. Please mark your calendar, reserve the time slot, and join the conference. We look forward to see you at Booth D15, Hall 9 in Hannover Messe.